Definition at line 39 of file llskiplist.h. Definition at line 42 of file llskiplist.h. Definition at line 44 of file llskiplist.h. Definition at line 43 of file llskiplist.h. Definition at line 168 of file llskiplist.h. References LLSkipList< DATA_TYPE, BINARY_DEPTH >::init(). Definition at line 177 of file llskiplist.h. Definition at line 186 of file llskiplist.h. References LLSkipList< DATA_TYPE, BINARY_DEPTH >::removeAllNodes(). Definition at line 204 of file llskiplist.h. References level, LLSkipList< DATA_TYPE, BINARY_DEPTH >::LLSkipNode::mForward, LLSkipList< DATA_TYPE, BINARY_DEPTH >::mHead, LLSkipList< DATA_TYPE, BINARY_DEPTH >::mInsertFirst, LLSkipList< DATA_TYPE, BINARY_DEPTH >::mLevel, LLSkipList< DATA_TYPE, BINARY_DEPTH >::mUpdate, and S32. Referenced by LLSkipList< DATA_TYPE, BINARY_DEPTH >::moveData(). Definition at line 267 of file llskiplist.h. Definition at line 123 of file llskiplist.h. Definition at line 458 of file llskiplist.h. References LLSkipList< DATA_TYPE, BINARY_DEPTH >::mCurrentOperatingp, LLSkipList< DATA_TYPE, BINARY_DEPTH >::mCurrentp, LLSkipList< DATA_TYPE, BINARY_DEPTH >::LLSkipNode::mData, and LLSkipList< DATA_TYPE, BINARY_DEPTH >::LLSkipNode::mForward. Definition at line 503 of file llskiplist.h. References LLSkipList< DATA_TYPE, BINARY_DEPTH >::mCurrentOperatingp, LLSkipList< DATA_TYPE, BINARY_DEPTH >::mCurrentp, LLSkipList< DATA_TYPE, BINARY_DEPTH >::LLSkipNode::mData, LLSkipList< DATA_TYPE, BINARY_DEPTH >::LLSkipNode::mForward, and LLSkipList< DATA_TYPE, BINARY_DEPTH >::mHead. Definition at line 315 of file llskiplist.h. References LLSkipList< DATA_TYPE, BINARY_DEPTH >::LLSkipNode::mForward, LLSkipList< DATA_TYPE, BINARY_DEPTH >::mHead, and NULL. Definition at line 475 of file llskiplist.h. Definition at line 152 of file llskiplist.h. References i, LLSkipList< DATA_TYPE, BINARY_DEPTH >::mCurrentOperatingp, LLSkipList< DATA_TYPE, BINARY_DEPTH >::mCurrentp, LLSkipList< DATA_TYPE, BINARY_DEPTH >::LLSkipNode::mForward, LLSkipList< DATA_TYPE, BINARY_DEPTH >::mHead, LLSkipList< DATA_TYPE, BINARY_DEPTH >::mLevel, LLSkipList< DATA_TYPE, BINARY_DEPTH >::mUpdate, NULL, and S32. Referenced by LLSkipList< DATA_TYPE, BINARY_DEPTH >::LLSkipList(). Definition at line 327 of file llskiplist.h. References LLSkipList< DATA_TYPE, BINARY_DEPTH >::addData(), and LLSkipList< DATA_TYPE, BINARY_DEPTH >::removeData(). Definition at line 424 of file llskiplist.h. References i, LLSkipList< DATA_TYPE, BINARY_DEPTH >::mCurrentOperatingp, LLSkipList< DATA_TYPE, BINARY_DEPTH >::mCurrentp, LLSkipList< DATA_TYPE, BINARY_DEPTH >::LLSkipNode::mForward, LLSkipList< DATA_TYPE, BINARY_DEPTH >::mHead, LLSkipList< DATA_TYPE, BINARY_DEPTH >::mUpdate, NULL, and S32. Referenced by LLSkipList< DATA_TYPE, BINARY_DEPTH >::~LLSkipList(). Definition at line 493 of file llskiplist.h. References LLSkipList< DATA_TYPE, BINARY_DEPTH >::mCurrentOperatingp, LLSkipList< DATA_TYPE, BINARY_DEPTH >::LLSkipNode::mData, and LLSkipList< DATA_TYPE, BINARY_DEPTH >::removeData(). Definition at line 336 of file llskiplist.h. Referenced by LLSkipList< DATA_TYPE, BINARY_DEPTH >::moveData(), and LLSkipList< DATA_TYPE, BINARY_DEPTH >::removeCurrentData(). Definition at line 450 of file llskiplist.h. 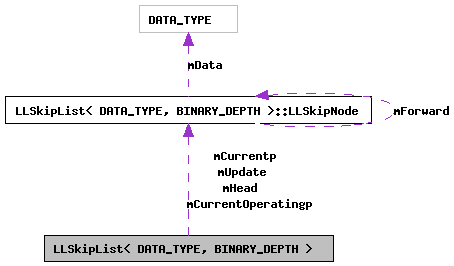 References LLSkipList< DATA_TYPE, BINARY_DEPTH >::mCurrentOperatingp, LLSkipList< DATA_TYPE, BINARY_DEPTH >::mCurrentp, LLSkipList< DATA_TYPE, BINARY_DEPTH >::LLSkipNode::mForward, and LLSkipList< DATA_TYPE, BINARY_DEPTH >::mHead. Definition at line 198 of file llskiplist.h. References LLSkipList< DATA_TYPE, BINARY_DEPTH >::mEquals. Definition at line 192 of file llskiplist.h. References LLSkipList< DATA_TYPE, BINARY_DEPTH >::mInsertFirst. Definition at line 132 of file llskiplist.h. Referenced by LLSkipList< DATA_TYPE, BINARY_DEPTH >::getCurrentData(), LLSkipList< DATA_TYPE, BINARY_DEPTH >::getFirstData(), LLSkipList< DATA_TYPE, BINARY_DEPTH >::getNextData(), LLSkipList< DATA_TYPE, BINARY_DEPTH >::init(), LLSkipList< DATA_TYPE, BINARY_DEPTH >::removeAllNodes(), LLSkipList< DATA_TYPE, BINARY_DEPTH >::removeCurrentData(), and LLSkipList< DATA_TYPE, BINARY_DEPTH >::resetList(). Definition at line 131 of file llskiplist.h. Referenced by LLSkipList< DATA_TYPE, BINARY_DEPTH >::getCurrentData(), LLSkipList< DATA_TYPE, BINARY_DEPTH >::getFirstData(), LLSkipList< DATA_TYPE, BINARY_DEPTH >::getNextData(), LLSkipList< DATA_TYPE, BINARY_DEPTH >::init(), LLSkipList< DATA_TYPE, BINARY_DEPTH >::removeAllNodes(), and LLSkipList< DATA_TYPE, BINARY_DEPTH >::resetList(). Definition at line 135 of file llskiplist.h. Referenced by LLSkipList< DATA_TYPE, BINARY_DEPTH >::setEquals(). Definition at line 129 of file llskiplist.h. Referenced by LLSkipList< DATA_TYPE, BINARY_DEPTH >::addData(), LLSkipList< DATA_TYPE, BINARY_DEPTH >::checkData(), LLSkipList< DATA_TYPE, BINARY_DEPTH >::getFirstData(), LLSkipList< DATA_TYPE, BINARY_DEPTH >::getLength(), LLSkipList< DATA_TYPE, BINARY_DEPTH >::init(), LLSkipList< DATA_TYPE, BINARY_DEPTH >::removeAllNodes(), LLSkipList< DATA_TYPE, BINARY_DEPTH >::removeData(), and LLSkipList< DATA_TYPE, BINARY_DEPTH >::resetList(). Definition at line 134 of file llskiplist.h. Referenced by LLSkipList< DATA_TYPE, BINARY_DEPTH >::addData(), LLSkipList< DATA_TYPE, BINARY_DEPTH >::checkData(), LLSkipList< DATA_TYPE, BINARY_DEPTH >::removeData(), and LLSkipList< DATA_TYPE, BINARY_DEPTH >::setInsertFirst(). Definition at line 133 of file llskiplist.h. Referenced by LLSkipList< DATA_TYPE, BINARY_DEPTH >::addData(), LLSkipList< DATA_TYPE, BINARY_DEPTH >::checkData(), LLSkipList< DATA_TYPE, BINARY_DEPTH >::init(), and LLSkipList< DATA_TYPE, BINARY_DEPTH >::removeData(). Definition at line 130 of file llskiplist.h. Referenced by LLSkipList< DATA_TYPE, BINARY_DEPTH >::addData(), LLSkipList< DATA_TYPE, BINARY_DEPTH >::checkData(), LLSkipList< DATA_TYPE, BINARY_DEPTH >::init(), LLSkipList< DATA_TYPE, BINARY_DEPTH >::removeAllNodes(), and LLSkipList< DATA_TYPE, BINARY_DEPTH >::removeData().